The ultimate frisbee club will be fighting for more than wins this Spring. They’ll be fighting for respect from the school community and a potential promotion to the “team” classification for the 2020 season. The roster has no shortage of athleticism and is led by a potent crop of juniors including Ben Morse, Tenzin Tsundue, Ethan Demaio, Owen Walkowicz, Sam Felton Emerick, Gabe Jones Thomson, Sam Battisti, and James Morgan. Eight members of the roster have participated in at least one varsity sport this year and six of the eight played key roles on the Western MA runner up soccer team. According to Ben Morse the club used to rely heavily on the deep pass but has worked hard to develop its short game. This year, the offensive attack will look to feature a balance of long, short, and intermediate length passes. Decision making will be a key factor in determining whether or not the Hawks can maximize their offensive efficiency. Last season the club struggled to keep possession of the disc when players rushed passes or tried to force them into well defended areas. The importance of minimizing turnovers is not lost on Ethan Demaio. “As a group we need to value every single offensive possession and focus on making the smart plays” said Demaio. Among the club’s top passers is Owen Walkowicz. His six foot four inch build and lengthy wingspan gives him the ability to see the entirety of the field and accurately throw the disc over defenders. “I really know all of my receivers tendencies. When I see them cut I put the disc in a position for them to make a play” said Walkowicz. One receiver Walkowicz is sure to target this season is deep threat Tenzin Tsundue. Tsundue uses his natural speed and quick first step to separate from defenders. He also makes sure to point out that his speed isn’t just reserved for offense. One of the biggest X factors for the ultimate club this year could be senior Carsten Carey. Carey has previously starred on Frontier’s cross country, basketball, and track teams. With his six foot eight inch frame, Carey has the catch radius of a three car garage and unparalleled blocking ability. He has been practicing with the club but may not be a full time member because of his newfound dedication to rowing. “There’s nothing I want to do more this Spring than row, and if it comes down to either shredding it up in the endzone or racing backward in a boat, you had better believe I’ll be on the water” said Carey. The club’s regular season slate is composed largely of area private schools. 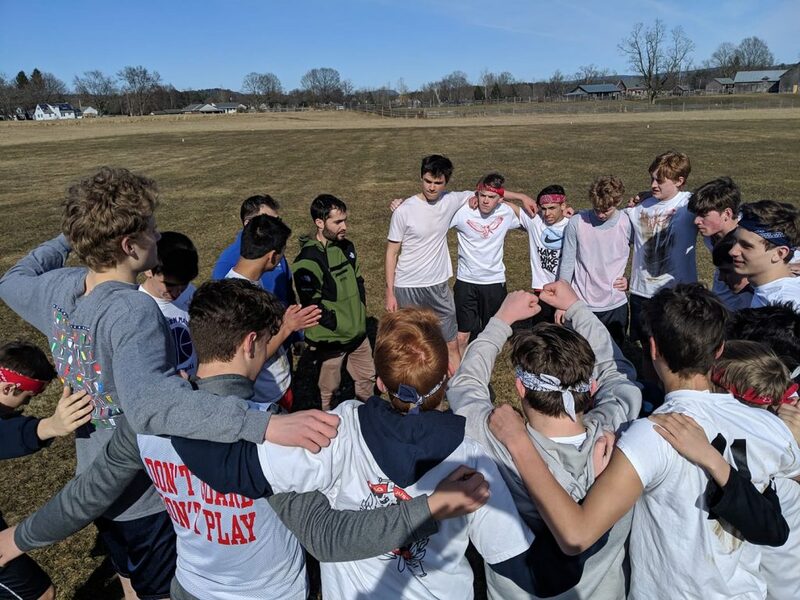 The main event of the season will be the Amherst Ultimate Tournament which is one of the premier high school ultimate events in the United States. The club is in the second highest division and hopes to compete for a championship. Members of the club have been pushing for years to host a night game under the lights on the football field. Whether or not they accomplish this goal, make sure to check out one of their home games at Sunderland Elementary this Spring. 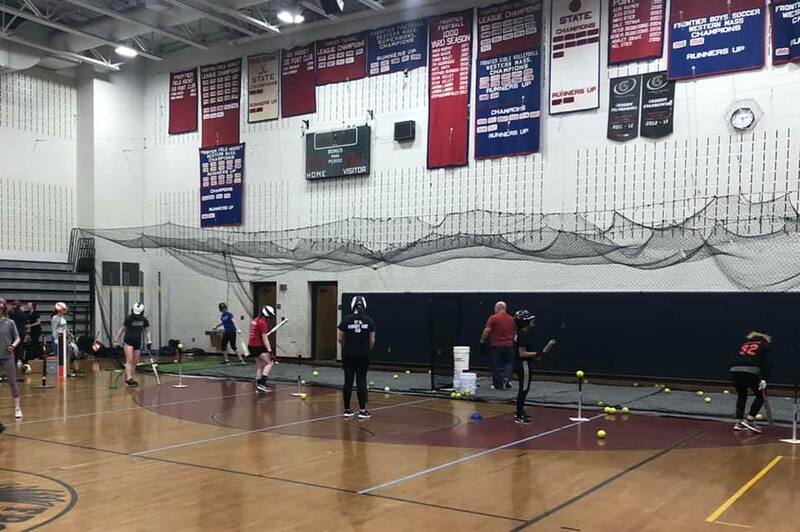 Fresh off a 12 win 9 loss season that ended with an 11-1 first round playoff loss to Wahconah, the Redhawks softball team has their eyes on another tournament run. The roster will be reminiscent of a fountain of youth after a number of key contributors from last year’s team graduated, including Lauren MacDonald, Emma Wesoloski, Kenzie Patterson, Kim Asseng and Kelsey Jarvis. This year the only seniors on the roster are Caroline Moreau and Ariana Walker. Going around the diamond the opening day starting lineup is likely to be Olivia Deane at pitcher, Lily Spencer at catcher, Maddie Fifield at first, Olivia Vecellio at second, Macy Ring at shortstop, Charlotte Doulette at third, Natalie Denkiewicz in center, Ariana Walker in left, and either Makayla Santos or Kaela Hawkins in right. Among the team’s top offensive weapons will be junior Natalie Denkiewicz who hit in the leadoff spot for the entirety of last season. Denkiewicz hit over .500 and only struck out once last season en route to a first team all Western MA selection. “We’re a young team that’s definitely hoping to make a tournament run. I’m really looking forward to enjoying some David’s buffalo ranch sunflower seeds in the outfield” said Denkiewicz. Charlotte Doulette was the team’s top power hitter a year ago. As only a freshman she led the team in homeruns and earned a second team all Western MA nod. This year she’ll look to rack up the RBIs and extra base hits out of the cleanup spot. Two new additions who are sure to make an impact this year are sophomore Macy Ring and junior Olivia Vecellio. Ring, a transfer from Hopkins Academy, has played on a number of top tier travel teams and will bring a more than capable glove and bat to the lineup. Vecellio has been a star on the track team the past two seasons, winning the Western MA championship in both discus and javelin a year ago. Vecellio has already committed to play field hockey at division one Bryant University but will bring her elite athleticism to the diamond this Spring. The biggest weakness Coach Garrett Deane will need to navigate in his second year is a lack of depth in the pitching staff. Sophomore Olivia Deane is the team’s top pitcher but is a member of the Dutch exchange and will be over 3000 miles away on opening day. Natalie Denkiewicz, Chloe Cutting, and Kaela Hawkins will look to eat up innings during Deane’s absence. The Redhawks schedule will be anything but a breeze as four of their games will come against reigning Western MA division three and division four champions Greenfield and Turners Falls. Make sure to come out and support as the Hawks play their home opener on April 15 against West Springfield. Be sure to check in with FCATMEDIA on YouTube for recorded games. Last Spring the boys track team had a successful season enroute to a second place finish at the Division 2 Western MA championships. The 2019 team will take to the oval with a shortage of familiar faces as key point getters Brandyn Robinson, Ben Litstoski, Tyler Mayrand, Aaron Landry, Zach Hamilton, and Matt Carlson all graduated. This year no one will carrier a heavier load than senior Phaelon Koski. A year ago Koski finished fourth at the Western MA championships in the 400 meter hurdles (59.12) and 11th in the long jump (18’ 4”). Koski has the ability to compete at a high level in a plethora of events including the 100, 100 hurdles, 400, 400 meter hurdles, long jump, and triple jump. His strong range will make him a favorite at the Western MA decathlon which will take place on June 3 and 4 at Hampshire Regional School. Jack Vecellio, Frontier’s freshman pole vaulting prodigy, will look to build upon an unfathomable eighth grade campaign. Competing against athletes several years older and nearly twice his size, Vecellio placed second at the Western MA championships, first at the Central West championships, and sixth at the all state meet. Vecellio’s sixth place finish at the state meet was good enough to qualify for the New England championships. After consistently breaking 12 feet last year Vecellio has his eyes on eclipsing the 13 foot mark this season. Frontier’s distance squad will be anchored by seniors Alex Sharp and George Balis. Sharp finished second in the mile (4:39) at last year’s Western MA championship while Balis had a breakout cross country campaign this past Fall which saw him break 18 minutes in the 5k. Other contributors this season will be George Tsaplin (sprints), Aidan Falla (middle distance), Jackie Phong (throws), Ryan Huit (throws), Emmet Mcgranaghan (pole vault, hurdles), and Eric Trueswell (sprints). In his 30th season as head coach, Walt Flynn is excited and optimistic about the 2019 season. Part of Flynn’s excitement is due to the large crop of middle schoolers who have joined the team. If they all stick around through high school the track team could be a force to be reckoned with for years to come. The team’s next home meet will be on April 10 against their rivals from Mohawk. 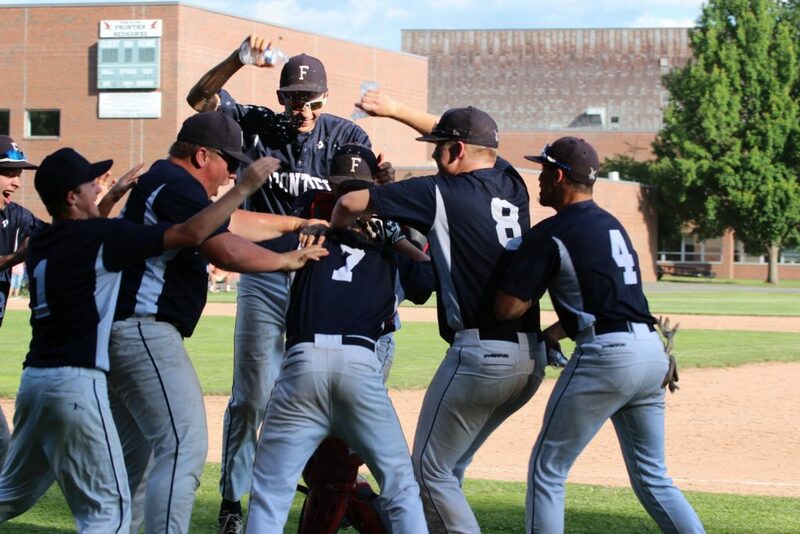 A memorable run for the 2018 Frontier boy’s baseball team came to a heartbreaking end with a 6-1 loss to Taconic in the Western MA division three championship game. Luckily for head coach Chris Williams and Redhawk fans, the bulk of the lineup is returning for the 2019 season. There will be no shortage of capable arms in the Redhawk bullpen as Dylan Appanel, Xavier Santiago, Matt Hildreth, Gabe Gochinski and Kalen Evans will all see time on the mound. Appanel may be the ace of the bunch. Last year he pitched to a 5-1 record while striking out 33 hitters over 28 innings of work. Senior Xavier Santiago is a new addition to the pitching staff and is throwing the ball well to start the season. He, along with the rest of the pitchers, will rely on potent off speed pitches to keep opposing hitters off balance. “My best pitch is probably my curveball. I feel confident throwing it in any count and it has a significant difference in speed compared to my fastball” said Santiago. Junior Garrett Deforest will be positioned behind the plate this season. He is undoubtedly one of the best fielding catchers in Western MA. Along with his exceptional ability to block pitches in the dirt, Deforest has a cannon that will make even the fastest base runners think twice before trying to swipe a base. The Redhawks will be a very strong defensive team all the way around the diamond as the entire infield and the majority of the outfield is returning from a season ago. Offensively the Redhawks should be even more dangerous this year. Matt Hildreth and Brian Bauman will bring speed and high contact rates to the top two spots in the batting order. The meat of the order will consist of power hitters Kiernan Freeman, Dylan Apanell, and Jacob Bryant. After that opposing pitchers will have to contend with Garrett Deforest, Kalen Evans, Kyle Barnes, and Zach Renaud. 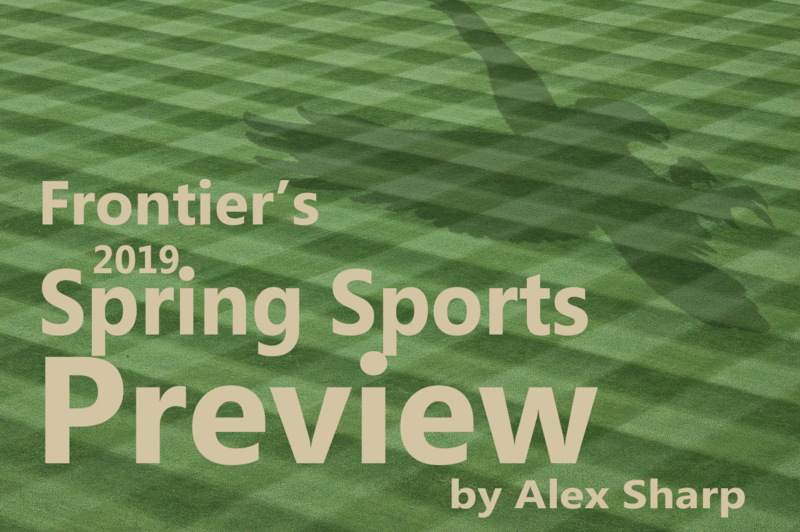 One of the top hitters for Frontier a year ago was center fielder Connor Waitkus. Waitkus is a member of the 2019 squad but will sit out the first five games of the season for disciplinary reasons. The Redhawks have had several preseason scrimmages including two on their annual weekend trip to Cape Cod. Junior second baseman Brian Bauman thinks these scrimmages effectively prepared the team for the start of the regular season. “After our two scrimmages at the Cape – beating a division one team – we have a lot of confidence going into the season. Heads aren’t too big though since our hitting isn’t where we want it to be yet” said Bauman. In the first game of the season the Redhawks flexed their offense and pitching in what appeared to be a 15-0 victory over Pioneer. Unfortunately a Redhawk player participated in the game despite being academically ineligible. Per MIAA rules the team was forced to forfeit the game. 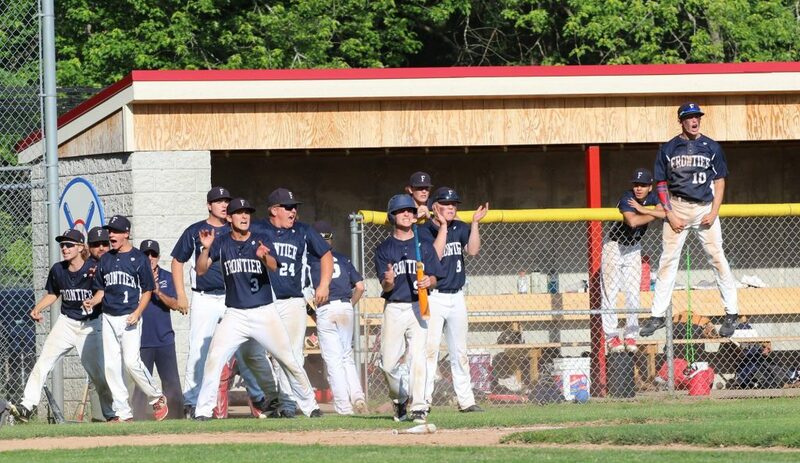 If there’s anything every member of the 2019 Frontier baseball team can agree upon it’s that there is only one goal for this season: To win a Western MA championship. With a great mixture of talent and experience, there’s no doubt the Hawks will be one of the top contenders when the postseason begins in June. After finishing seventh at last year’s Western MA championship the girl’s track team returns a collection of experienced and youthful talent. The biggest loss for the girl’s track team is undoubtedly Olivia Vecellio’s departure to the softball team. 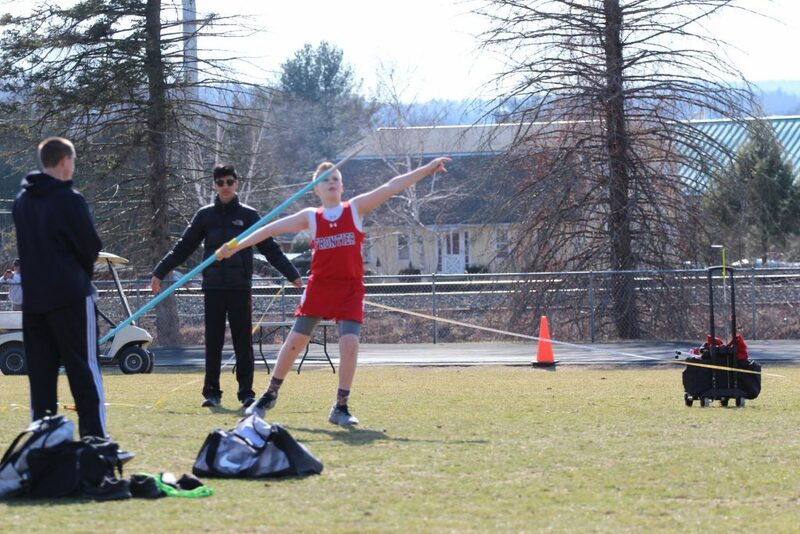 With her first place finishes in both the javelin and discus at last year’s Western MA championship, Vecellio accounted for 20 of the teams 41.5 points. Even without Vecellio, the winner of this year’s javelin throw at the Western MA meet could be wearing a Frontier uniform. Sophomore Reilly Isler finished third (98.5’) at last years meet with an identical distance to second place finisher Laura Thomas of Drury. Since Thomas returns for her senior season, javelin fans could be in for a battle at this year’s championship meet. Jenna Martin was the team’s leading point scorer last season and all signs point to another outstanding season this Spring. At last year’s Wmass meet Martin finished 8th in the 400 hurdles (1:13.24), 11th in the high jump (4’ 6”), and was a member of the 8th place finishing 4×100 meter relay. Freshman Lilah Evans will be one of the team’s top sprinters. Last year Evans took 15th in the 100 meter dash (14.04) and 10th in the 200 meter dash (28.71) at the Western MA championships. In each event she was the top middle school finisher. Also contributing in the sprints will be sophomore Sierra Warren who finished 15th in the 200 meter dash (29.33) at Western MA last year. Senior Marisela Ackerman will look to build upon a strong season a year ago that saw her finish fifth in the 400 meter dash (1:03:37) and 16th in the triple jump (30’ 4.5”) at the Western MA championships. The girl’s 400 at Wmass this year should be an exciting race as nine of the top ten finishers from last year’s race return. Expect Ackerman to be right in the mix competing for the top spot. Eva Howard, Alyson Barnes, Angelina England, Emily Laus, and Marie Diemand will look to carry a distance squad that failed to qualify a runner to Western MA in the 800, mile, or two mile a season ago. In other events senior Ivy Shattuck will lead the discus throwers a year after finishing 14th at Wmass (76’ 2”) and Maddie Leone is expected to be the top pole vaulter. The girl’s team has split their first two meets with a loss to South Hadley (86-59) and a victory over Southwick (79-66). The team’s next meet will be April 11 vs Mohawk. The Frontier tennis team has a new coach at the helm this Spring. James Fitzgerald replaces longtime coach Steve Barrett who retired after last season. Fitzgerald has a personal trainer background and has brought an energetic approach to the tennis team. After dropping a tough first match to Greenfield a week ago Fitzgerald told the Greenfield Recorder he was happy with the team’s effort. Leading the way this year will be a contingent of juniors consisting of Tori Speth, Cassidy Bardwell, Sofia Patten, and Jalen Sullivan. Sophomore team members include Cambrie Hamilton, Isabelle Brown, Mary Laurens, and Kayleigh Acorn. Coleman Hartner is the lone eighth grader on the team. In the first match of the season Tori Speth played first singles, Mary Laurens played second singles, and Kayleigh Acorn played third singles. Cassidy Bardwell and Coleman Hartner played first doubles while Sophia Patten and Jalen Sullivan played second doubles. Speth is the team’s leader and top player. Last year she went 8-3 and was named all league and second team all Wmass. Seven of her eight victories came in straight sets. 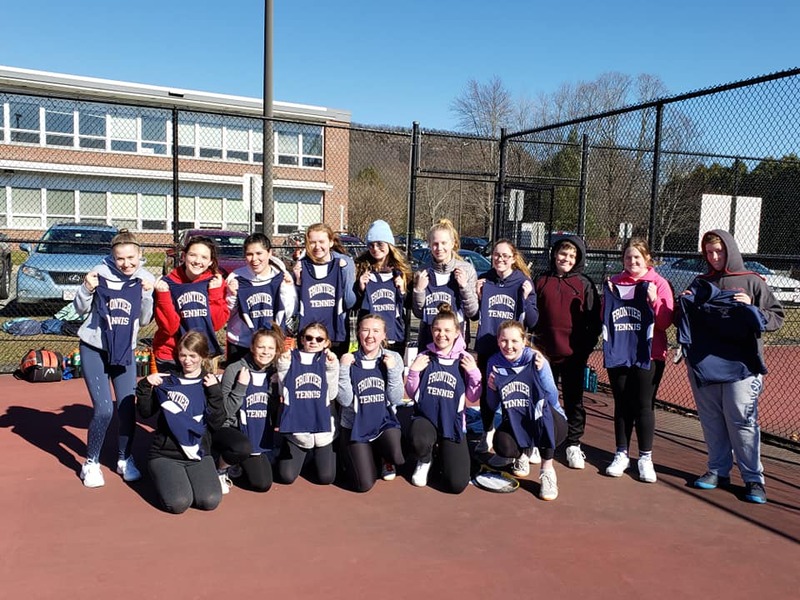 The tennis team will play its next home match against Pioneer Valley Christian on April 10.